Our very early forebears had no eyes, then a later generation gained cells that could detect light, then the direction of that light, then a second set of such cells and so on through millions of years, through to some 100,000 years ago, when we were hunter/gatherers and had to find our food by using spears and bows and arrows, and at the same time avoid being someone else’s meal. Our eyes had evolved for just that sort of existence and they’ve not changed much since then. 100,000 years is quite short in evolutionary terms. So, what are they, how do they work and how good are they? 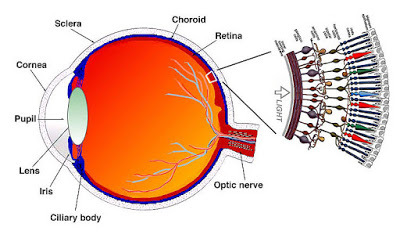 They are a 30mm ball of transparent fluid with a hole (the Pupil) and a lens at the front, and a sensor system (the Retina) at the rear, similar to your camera, an iris and lens at the front and sensor at the rear, you could liken the retina to the chip in your camera. Not really like the camera chip, as that is flat, very flat, whereas the Retina is spherically shaped, but it matches the single element lens it works with whose focal plane is also spherical, so we see in good detail all round. This applies to all lenses, all single element lenses have a focal plane that is curved, the shorter the focal length the tighter the curve. As a camera the eyes have a set exposure of about 1/10 sec. and a variable aperture of some 7 to 8mm when we are young, but that shrinks to about 5mm or less when we’re getting on. The sensor system consists of lots of individual sensor elements like pixels in your camera, these are the Rods and Cones. 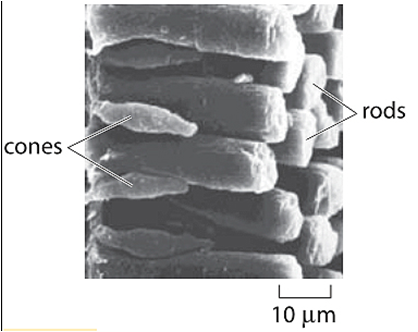 The Cones are sensitive to colour and the Rods are not, but are 1000x more sensitive than the Cones. There are about 150million Rods and some 60 million Cones. The Fovea, surrounded by the Macula, is on the optical centreline of the eye, and is where the Cones are most heavily concentrated to make this the area of most acute vision. So to see something most clearly we stare directly at it. And we automatically do this, but it is counter-productive for astronomers looking for faint objects. The Cones rapidly thin out further away from the Fovea, whereas the Rod population increases, with the densest concentration in a ring about 15 to 20° away from the Fovea. This suits the hunter, who needed to see very clearly what he was aiming his arrow at, but at the same time be aware of what might be hunting him approaching from the side. The Rods are especially good at seeing movement, something “out of the corner of the eye”. How do the eyes work? 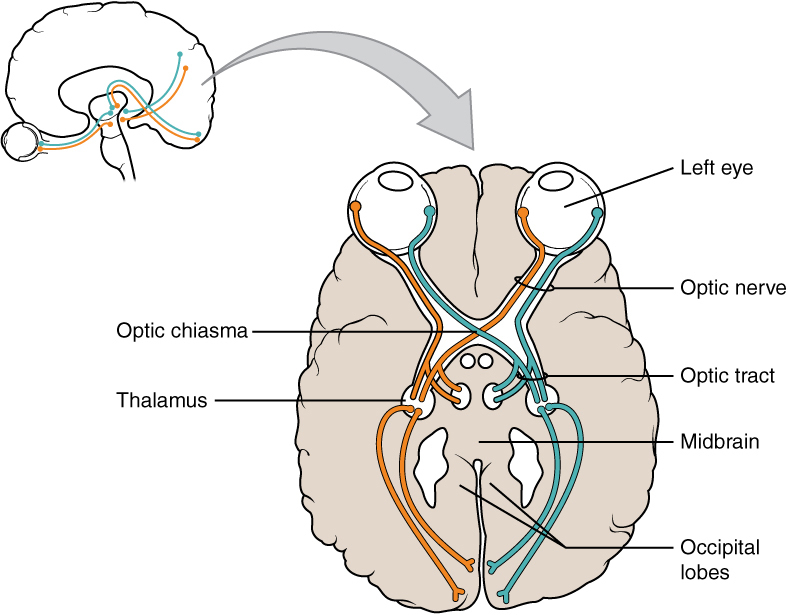 They operate like a cine camera, they take a 1/10th of a second shot, the data is then sent down the Optic Nerve into the brain (the eyes are really part of the brain rather than an outside organ like the heart or lungs). There the brain does a Photoshop job on the shot, including turning it upside down, and holds it up for the Fat Controller to judge. Then the data is discarded, and another shot is taken, and so on every 1/10th of a second, all the time your eyes are open. In the case of our early forbears, if the Rods see something out of the corner, they tell the Fat Controller who tells the eyes to look to that side, the adrenal gland to give the heart a quick squirt and the legs to run. Those who know of cinema will know that 24 frames/sec is the norm for giving the appearance of fluidity of motion to a series of still frames, so the brain has to fill in the spaces to give the impression of continuous motion, which accounts for it showing you things you sometimes thought you saw but didn’t. To be able to see things we need to get enough photons onto the Retina, and to see faint things we need as many as we can get. So how many photons can we gather? That depends on the diameter of the pupil and the length of time it is receiving them, but we are stuck with a 1/10th of a second for the exposure so it all depends on the size of the pupil. 30/5 = an F/6 system. F/3.75 for an 8mm pupil. Pi x Radius x Radius = Area of pupil 3.142 x 2.5 x 2.5 = 19.64 sq mm. This means we can gather photons in a field of just under 20sq mm. If you’re young with an 8mm pupil it will be 50 sq mm. That’s as much as you can do with no optical aid. Fortunately someone invented the telescope and others worked to improve it. What does the telescope do for us? It helps get more photons to our Retina, the bigger the aperture of the telescope, the better. The best telescope we have for visual observing is the 14” Meade. Isaac Newton discovered that white light would be split into a rainbow of colours by a glass prism, and that a telescope lens could be thought of as an infinite number of prisms in a line (he also invented calculus). This meant that a lens would split white into colours, Red focusing further from the lens and Blue closer with Green in between. This, he said, was the cause of the stars being blurry in telescopes. Moreover, all transparent media will always have this problem, and the only way out of it was to use mirrors, which focused all the colours equally. But he was wrong! From the time of Galileo to the advent of the Achromat, about 1760, tolerably good telescopes, were made and used for scientific research, by people like Huygens, Cassini and Hevelius, perhaps the smallest would have an objective of 25mm diameter and a focal length of 1000mm, f/40. For a 60mm objective, they’d have to grind and polish the curve, and they were usually plano-convex, to give a focal length of 5000mm, f/80. A 100mm objective would need to have a focal length of 15000mm, f/150. Though they showed lots of colour they were considered serious research instruments. Diffraction-limited? Not over the whole visible spectrum, as is expected today, but over the green part, the part that human eyes are tuned to, yes, and reasonably so, but with plenty of colour that they had to accept. Used with a singlet, a Kepler eyepiece, of not unusually 150mm focal length, the 100mm objective would give magnifications of 100x, an exit pupil of 1mm, and a field of view of 9 arcmin, not bad for a 4″ telescope, except for the colour and handling problems of course. Incidentally, the blue would have focussed 250mm closer to the objective than the red. Despite the difficulties, they made many discoveries with these instruments. An extreme example of how far astronomers would go to improve the quality of the view through the telescope. This was one built by Johannes Hevelius, in 1647, on top of three adjoining houses in Gdansk. He wouldn’t have had light pollution but may have had smoke pollution from the houses in winter and verbal pollution from the neighbours. But perhaps not, as he was the local brewer and Town Mayor. 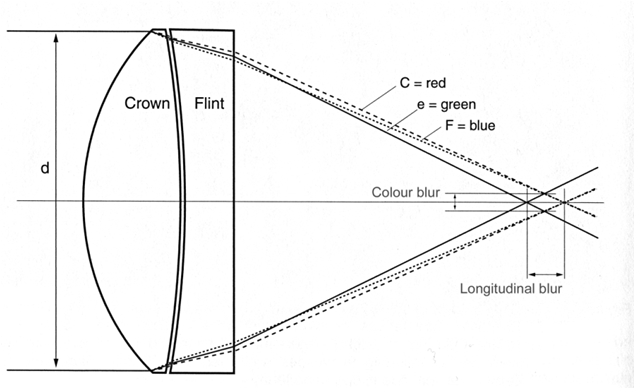 The problem of having to use very long telescopes, because of the single element lens, usually made of Crown glass, was solved by Dolland, who replaced the singlet with a doublet, one of Flint glass and the other of Crown. Flint was used for cut glass ware, Crown was used for windows. Telescopes could now be made much shorter because the doublet brought the red and blue colours to the same focal plane. The Apochromat came much later and brought red, blue, and green to the same focal plane, but it needed the use of more exotic glasses or crystals. This is the nature of all single element lenses, and much of the design of telescopes and eyepieces and camera lenses is aimed at making the focal plane as flat as possible, and getting the colours to focus at the same point. And this is a first step in that direction, made by Dolland. Marrying them produces an Achromat that focuses the red and blue to the same plane. Designs of ‘popular amateur’ telescopes are of course, made as cheaply as possible, and a spherical surface is the easiest, thence the cheapest surface to make, and can be made on automatic machines. The primary is usually a concave ellipse, though sometimes a sphere, and the secondary a convex sphere. It performs as a standard Cassegrain but is the equivalent of the best when fitted with a corrector system, and has a good wide flat field. It easily matches an RC Cassegrain or a Klevtsov Cassegrain. Now a classic, much beloved by amateurs for its portability and cost. A spherical concave primary and a spherical convex secondary, the coupling of which would produce a poor image, but the corrector plate does just that, it corrects the image. Not a very wide flat field. Both elements have spherical surfaces, the primary concave and the secondary convex, the secondary is very thick and makes it quite heavy, so is usually not made in large sizes and usually of large focal ratios. This version takes the focal plane well back so enabling the image to be the ‘right-way-up’. 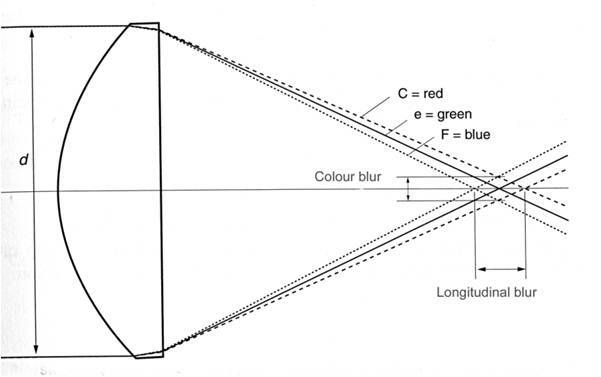 This design, used by Takahashi for its FSQ telescopes, carries an Apochromatic objective, using an element of fluorite crystal and one of exotic glass, coupled with a doublet acting as a field flattener to give a very wide flat field. The RC design uses 2 hyperbolic mirrors, a concave primary and a convex secondary, both difficult to make. It doesn’t have a wide flat focal plane unless fitted with a corrector system. 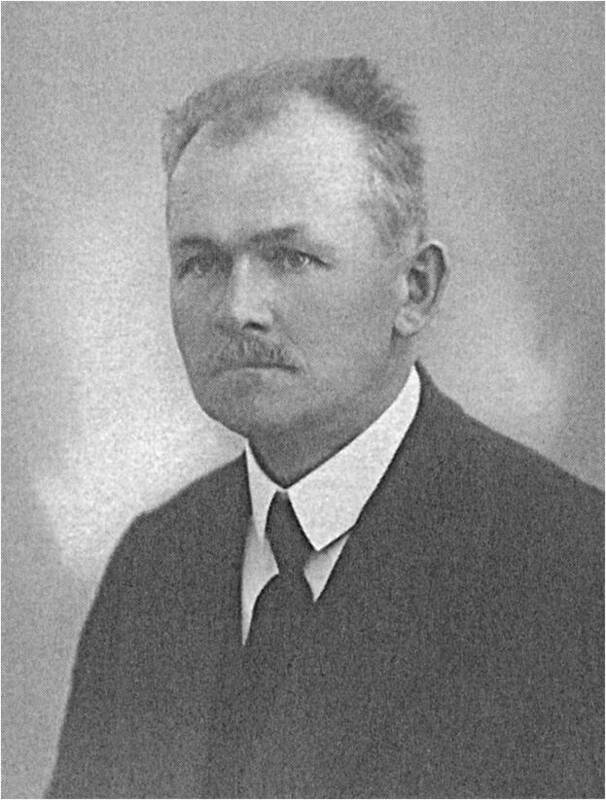 Bernhard Schmidt, in 1929, designed the Schmidt Camera and Corrector Plate and how to make it. He had only one hand too. The design was then modified by Baker and put into production by Tom Johnson, who, In 1970, produced the C8 Celestron. 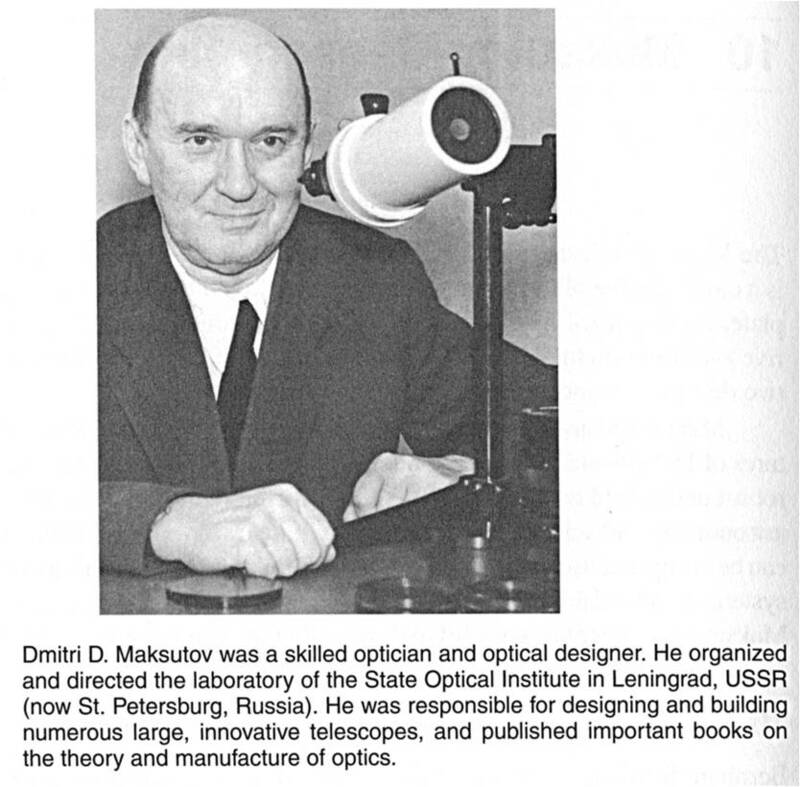 He patented the Maksutov system in 1941. It adds a meniscus lens to a Cassegrain, or Newtonian to correct aberrations. In a Cassegrain the secondary mirror is usually a silvered patch on the rear of the meniscus corrector. Choose among these for the best observing eyepieces. Unfortunately, as you’d expect, the best cost the most. Almost all are perfect on the centreline but get worse as you move out towards the edge. To see the very faintest objects that we can, we must be completely dark adapted. This can take about 30 mins. To preserve dark adaption, a faint red light can be used to read star charts. But if the red light is too bright it will affect dark adaption. Use averted vision. Look slightly to the side of the object to be observed. Find where your faint vision is best, it should be about 15 – 20 degrees from looking straight forward. This takes some practice. Don’t turn your head, don’t turn your eyes, look ahead but turn your attention and concentration to the side. Tap the scope lightly while observing, as the rods are extremely sensitive to motion, having evolved to watch for lions to the left of them and lions to the right of them while looking at the antelope in front. Don’t hold your breath, continue to breathe regularly, the eyes and brain need oxygen to function. Get up as high as you can, above some of the atmosphere. Somewhere around 1500 metres is probably optimal. Difficult in Doncaster. Increase the magnification. 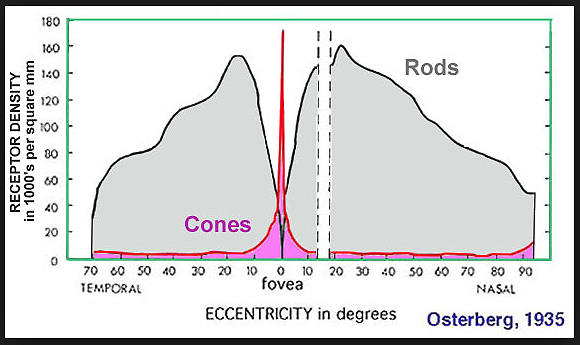 There is a minimum amount of magnification needed by the eye to see faint objects because the rods are not as densely packed as the cones in the fovea and they do not have as high a resolving power. Magnification also increases the contrast between the object and the sky background. The amount needed is more than you’d imagine. Observe on a night of good transparency. Seeing is when the air is steady, as sometimes seen when there is a temperature inversion, like on humid summer nights. Transparency is when the air is clean, as seen sometimes in winter with polar air masses, or after a rain shower. Get to know your area and choose a view, where you can see if the distant trees or houses are distinct or fuzzy. When the blacks are black and the whites are white, that’s a night of good transparency. If they are hazy, stay in and prepare for when the night is less hazy. Don’t just glance at the object as visitors do when shown something. You must give your eye long enough to get acclimatised to it. A quick glance is not enough to appreciate what you are looking at. Don’t grow old As we age, the maximum amount that the pupil can dilate grows less by a couple of millimetres, which can halve the amount of light that enters the eye. Increased magnification helps here by reducing the pencil of light from the eyepiece into the smaller pupil. The eye’s lens also yellows with age and may form cataracts, damaging vision. And when you have found what you are looking for, look at it and keep looking at it, seeking detail. There has always been discussion around the choice of reflectors or refractors for visual observing, it comes down to personal preferences really as both have good and less good points. Much swinging round the presence or absence of the secondary mirror which takes up valuable photon gathering area and also softens the image generally by spreading some of the light into secondary and tertiary rings of the star’s Airy disc. In which case the smaller the secondary, the better. On the other hand, for much the same light grasp, the cost of a 14” aperture reflector is far easier to live with than a 14” refractor which would be more costly in the telescope and the mount to carry it, and the building to house it. Very unlikely to be as portable as a 14″ mirror system either. So it settles down to preferences, of telescopes and objects sought. Some objects, like double stars and variables are better studied with lens systems, whereas nebulae are better worked on with mirror systems. A rarely used option is that which was adopted by Hershel, who wearied of the loss of light in his 18” reflector’s primary and secondary mirrors. Being made of Speculum metal they each reflected only some 60% of the light received. Two such mirrors reduced the total down to 36%. So he adjusted the telescope to eliminate the secondary, and peered over the edge of the top of the tube instead, doubling the brightness of the image. His limitation though was that his telescope was 20′ long, and had to be moved about by helpers. Furthermore, the modern observer, unless he has very deep pockets, will try to maximise the value of his purchase by choosing an instrument that would be useable for photography too, which turns him to consider Cassegrain systems of various designs. Advances in telescope designs, glasses, coatings etc., and failures in ambient light conditions in populated parts of tthe world, have blurred the differences between refractors and reflectors. There is a healthy community, of amateur optical designers, working away at computers in back rooms producing designs, then building them, and comparing notes within the community with some coming into the professional market. In fact the LSST, Large Synoptic Survey Telescope, will carry an 8.4Metre 3 mirror telescope whose design came from this community. 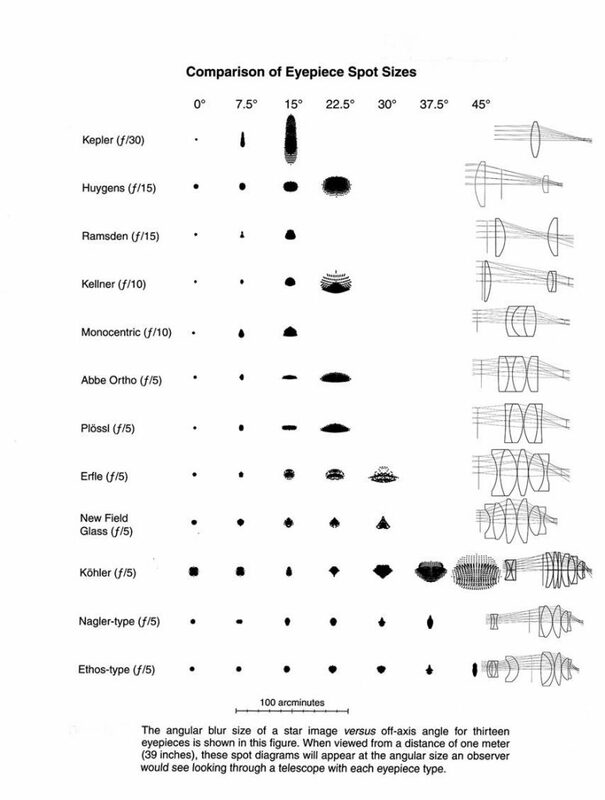 A look at the list of eyepieces earlier, will show that modern eyepieces use many more elements than those of earlier times, when more glass that had to be looked through meant reduced brightness. Such is the effect that improvements in glasses and coatings have had. One of the reasons that astronomical telescopes give an ‘upside-down’ image was to eliminate the need for additional elements to look through to turn the image the ‘right-way-up’.